Aside from the ROG Strix Scar II and ROG Strix Hero II, another ASUS ROG gaming laptop powered with the latest NVIDIA GeForce RTX GPUs will soon arrive in the Philippines–the ROG Zephyrus S GX701. 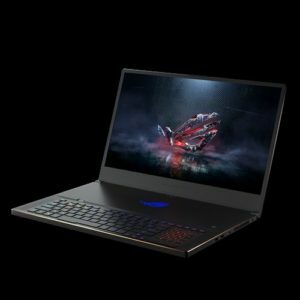 Touted the world’s slimmest 17-inch gaming laptop powered by NVIDIA’s RTX 2080 Max-Q graphics, this ROG machine is the first-ever model in the Zephyrus series to carry a 17-inch display. This machine takes cues, design-wise, from the original Zephyrus S GX531. The Zephyrus S GX701 sports a super narrow bezel with 144Hz, 3ms Full HD screen. In addition, this laptop also has the NVIDIA G-SYNC and Optimus technology, as well as a PANTONE-validated panel. Cooling the RTX 2080 Max-Q GPU is the patented Active Aerodynamic System (AAS) and dual 12-volt fans and a thermal management system. This Zephyrus model carries up to 24GB DDR4 2666MHz RAM and up to 1TB NVMe PCIe SSD storage. ASUS is yet to announce the pricing and availability for the 17-inch ROG Zephyrus S. But we’ll keep you posted once we all have the details.